When the nonprofit Food for Thought-Denver outlined a strategy to address local youth hunger, they quickly identified a need to help elementary school children who relied on school breakfast and lunch during the week but went without that support on the weekends. “Several studies and local feedback found that some students are unprepared to learn on Monday morning because the last meal they’ve had was at school the Friday before,” notes Food for Thought-Denver executive board member Michael Wray, a Metropolitan State University of Denver professor of restaurant management. 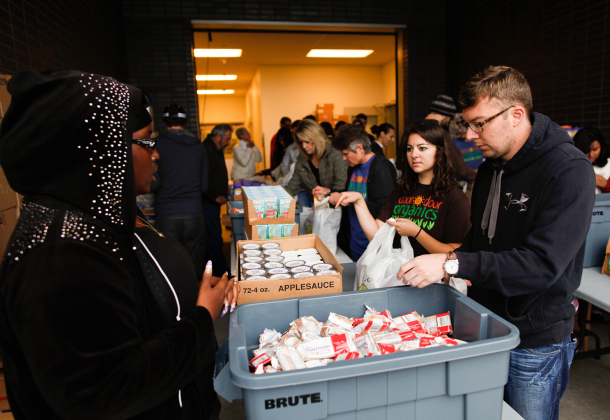 Wray stepped up to the challenge, bringing together a committed group of MSU Denver faculty and staff to help assemble food baskets and securing the University’s Hospitality Learning Center as the home for Food for Thought-Denver in 2012. Every Friday morning since then, Food for Thought-Denver and MSU Denver volunteers have gathered at the Hospitality Learning Center to put together approximately 1,200 “Powersacks” of nutritious meals. The Powersacks are provided to students at four Denver elementary schools: Columbian Elementary, Fairview Elementary, Greenlee Elementary and Garden Place Academy. Together, students and their families receive approximately 100 tons of food each year. Ensuring kids won’t go hungry is what it’s all about for these volunteers. Approximately one in seven Coloradans struggle to feed their children or themselves, according to a 2013 Household Food Security study by the U.S. Department of Agriculture. Ninety percent of the students helped by Food for Thought-Denver live below the poverty level.